After the Kalinga expedition, Sri Krishna Deva Raya went on a pilgrimage in the south – both to celebrate his victory and his marriage to Kalinga princess Jaganmohini. The only incongruity is the word Srimukha, denoting the year 1513, by which time, this wouldn’t have happened. But, going by the fact that the author Viswanatha Sthanapati clubbed Raichur campaign with Kalinga campaign, he may have embellished a few more facts to the pilgrim circuit. At Tirupati he performed all the sixteen danas as laid down in the sastras, and presented to the god valuable jewels and gold. He also had copper statues of himself and his two queens Tirumala Devi and Chinna Devi, cast and set them before the god of the place that they may signify his constant worship. He thence moved to Kalahasti where he also made large grants to the god on the twelfth day of the bright fortnight of Ashvayuja in the year Srimukha. He also constructed at Kalahasti several choultries. He then marched to the south visiting on his way all the chief temples. He is said to have visited the god Vandisvara who was worshipped by the Tripuras (Rakshasas). Among the places that he visited were Alagar Gudi (Alagar Koil or Tirumalirunjolai near Madura), Madura, Srivilliputtur, Karuvanallur, Sankaranarayanarkoil, Dakshina Kasi (Tenkasi), Trikutachalam (Kurralam), Agastyaparvatam (Podiyil hill), Gajendramoksham, Salivatam (Tinnevelly), Totadri (Vanamamalai), Tirukkurungudi, Kanyakumari, Srikandur (Tiruchendur), Nava Tirupati (near Alvar Tirunagari). His grants to the god Sundaresvara and Meeakshi at Madura, to the goddess Andal of Srivilliputtur were specially valuable. He constructed the big tank at Srivilliputtur and endowed a lakh of Madas towards the cost of the Mantapa in its centre and the stone work. At Agastyaparvata he constructed a new Gopura, and at Tinnevelly the Tamrasabha, a big stone hall covered over with sheets of copper. 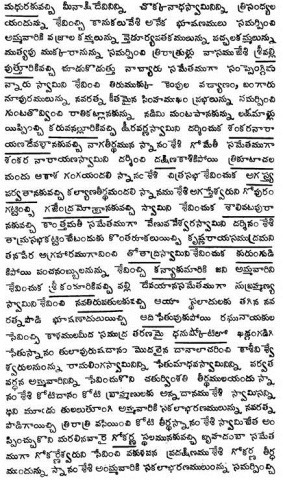 He founded a village called Krishnarayasamudram near Tinnevelly. ­Krishna Raya then went to Setu (Ramesvaram) and worshipped the god there. Thence he crossed over in barges (Kalams) to Dhanushkoti. There he washed the blood stains off his sword and performed three Tulabharas (weighing against gold). He stayed there for three days and thence went to Gokarnam. After worshipping at the place he returned to his capital Vijayanagar by way of Seringapatam after a long absence. There he made very costly presents to the gods Vitthala and Virupaksha and held his darbar on an auspicious day with all his relations and ministers. Is Krishna Raya’s Piligrimage after war, a tradition or just it happened? 1509-11 Bahamani attack on Vijayanagar. The dates are based on the fact that Bahamanis invaded within months of Krishna Raya on throne and Yusuf Adil Shah was shot dead in Kovilkonda in 1511. If he did that pilgrimage, which is always possible, it can never happen before 1517. Also to note the fact that he fielded 10 lakhs in Raichur, that is going to take a massive preparation, meaning it’s hard for him not to be in capital for a long time. 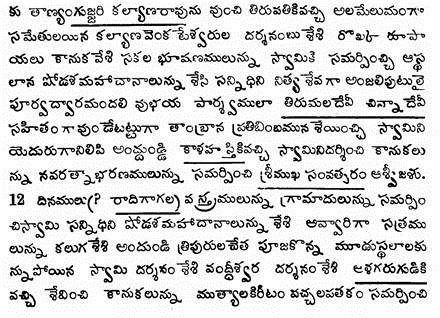 Possibly, he did this in 1517 when he visited Tirupati or after 1520. Is this a single trip or is this an amalgamation of multiple trips, I have no answer as of now.